A Republican lawmaker made sure everyone in attendance at a committee meeting knew he was straight, while telling his Democratic colleague not to touch him. 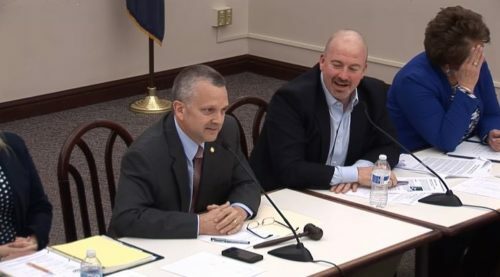 Pennsylvania Rep. Matt Bradford had briefly placed his hand on the sleeve of Rep. Daryl Metcalfe in order to gain his attention during a discussion about land use. This set off Metcalfe in a way that in no way suggests his sexuality is so fragile that a light breeze might set it atilt. Whoa there, buddy, who are you trying to convince? The childish outburst elicited uncomfortable laughter from those in attendance. But the socially awkward homophobe continued. “It’s like, keep your hands to yourself. Like, if you want to touch somebody, you have people on your side of the aisle who might like it, I don’t,” he said. “Chairman, okay, we’re officially off the rails,” Bradford, who is married to a woman, and has four children, said, laughing. “My intent was just to beg for your permission for about 30 seconds,” he explained. “Then beg, don’t touch,” Metcalfe shot back. “I don’t know where we go from here, really,” Bradford said, as the strained laughter continued. Bradford then called to have the meeting stay on topic. Metcalfe, who was first elected in 1998, sponsored legislation to define marriage as between only one man and one woman through Constitutional amendment. In 2013, he stopped openly gay Rep. Brian Sims from speaking about marriage equality from the House floor. He then admitted he was motivated to do so because of his religious beliefs. Watch video of Metcalfe’s outburst below and make sure to check out Sims’ full reaction too.